St. Innocent Orthodox Church - Why Relics? WHY IS IT DIFFICULT TO UNDERSTAND THE MEANING AND IMPORTANCE OF RELICS? Understanding why icons and saints are so important to the Orthodox Faith (see the 2 previous articles, Why Icons? and Why Saints?) might seem easy compared to understanding the veneration of saints' relics (their bodies). Why do Orthodox Christians lay out the dead bodies of saints in "fancy" caskets (reliquaries), place them in prominent places in churches, travel great distances to where these bodies/relics are in order to venerate and kiss them, and to pray to the saints by their relics, and to participate in frequent prayer services (akathists and/or molebens) by these relics? Why are the saints' bodies important? This essay will seek to answer precisely these questions. Certainly, these seemingly prevalent attitudes in North America are sad and unfortunate, and of course, are totally un-Orthodox or even anti-Orthodox. (We might remind the reader that the rejection of the very concept of saints and the veneration of their relics was a significant element of the 16th century Protestant Reformation.) To a certain extent, however, it is understandable that these attitudes prevail today in America, for two major reasons. The first major reason for these prevalent attitudes towards saints' relics is the lack of experience and exposure in North America to the relics of saints. We have only very few full relics (by this we mean the entire, complete body) of saints in America, and most of those whom we do have, have been glorified as saints only quite recently. Father Herman of Alaska is the only complete relic whose holy presence has blessed us for a long time (since 1837), and not many people get to go to Kodiak Island, Alaska, where his relics are now (see photo below), having been brought there from Spruce Island, which is far more remote than Kodiak, at the time of his glorification in 1970. (Presently, there are also the complete relics of St. Alexis Toth at St. Tikhon's Monastery/Seminary in South Canaan, Pennsylvania; St. John Maximovich in San Francisco; and St. Raphael in Antiochian Village, Ligonier, PA.) Thus, most North American-born Orthodox have not grown up accustomed to the awesome and miraculous presence of the relics of saints that exists in traditionally Orthodox countries, such as Russia, Greece and Romania, (unless they have traveled to these other countries as Orthodox pilgrims). American Orthodox have not had the opportunity to become accustomed to making pilgrimages to the saints' relics, or participating in the saints' annual feast day celebrations. They have not had the opportunity and blessing of seeing and participating in this vital aspect of traditional Orthodox life. Therefore, they haven't yet acquired this gift of Orthodox vision — of seeing the phenomenon of venerating saints' relics from an Orthodox perspective. The lack of experience with saints' relics leads naturally to the second rather understandable reason for the apparently prevalent indifference to the saints and their relics, namely, the lack of understanding and knowledge about this important aspect of Orthodoxy — for it can be difficult to understand something that is outside one's experience. Having thus speculated about why it is difficult for Americans to understand the meaning and importance of saints' relics and their veneration, and having made an observation about the seemingly prevalent attitudes towards the saints and their relics, and why these attitudes might exist, let us now turn our attention to trying to explain precisely why veneration of the saints' relics is so important to Orthodoxy. WHY IS THE VENERATION OF SAINTS' RELICS SO IMPORTANT TO ORTHODOXY? Why do we venerate saints and their relics? Certainly, the saints do not NEED to be glorified by us as saints. The only reason the Holy Orthodox Church glorifies saints is to help us. The Lord's saints manifest themselves to us who are still on earth in order to assist us. The Lord gives to us the relics of His saints as a means of grace for us — a visible and tangible means of contact, and as a vehicle of innumerable miracles — just as He gives to us icons and the Holy Mysteries (Sacraments) as vehicles of Divine Grace. ♦ (a) Saints' relics and their veneration are very closely related to the concept of holiness and why there MUST be saints and MUST be icons. (See the other Articles on this website, Why Icons?, Prayers for the Journey along the Way, especially #4, "Holiness," and most particularly, Why Saints?) Relics affirm every single assertion made in the Why Saints? article. ♦ (b) The veneration of saints is vital to the life of the Holy Orthodox Church, because the existence of saints affirms that it is truly possible to fulfill the Christian vocation — to become conformed to the image of Christ — because every Christian is called to be a saint, for Christ commanded us to be perfect as our heavenly Father is perfect. ♦ (c) The theology of the icon is in part also the theology of the veneration of saints' relics and their frequent incorruption — in essence, that the body participates in the process of transfiguration / sanctification / deification / theosis — different words for the same process of salvation. ♦ (d) The veneration of saints' relics and their frequent incorruption affirm that the physical world indeed does have the potential for being transfigured and resurrected, as it participates in the restoration of humanity to the beauty of the Divine Image and Likeness. That the physical world participates in the process of sanctification is a fundamental element of Orthodox spiritual theology, and is an underlying principle in both the theology of icons and the theology of the veneration of saints' relics. In this, Orthodoxy diverges to some extent from Roman Catholic theology, and diverges enormously from Protestant theology, which vehemently denies the possibility of the deification (theosis) of humans or the sanctification of the material world. However, it is exactly these very principles (of theosis and sanctification of the physical world), that are manifested and achieved during the years of ascetic and spiritual experiences practiced by so many of the saints, that accounts for the widespread occurrence of the incorruption of saints' bodies. Basically, the saints bodies were so transfigured and deified by their sanctity, that even after their souls separated from their bodies, the elevated sanctity of their bodies remained, so that their flesh did not decompose, and their bodies exude a sweet fragrance. However, even for most of the saints, to whom the gift of incorruption was not given, their bones still exude the miraculous power of the first-fruits of the resurrection and of the Kingdom of God. ♦ (e) Incorruption of relics, like icons, affirm that the physical world indeed DOES have the potential for being transfigured and resurrected, as it participates in the restoration of humanity to the beauty of the Divine Image and Likeness. The sanctified and transfigured bodies of the saints, (whether or not they are incorrupt), are so powerful that numerous miracles occur by means of the saint's relics, or even by being annointed with oil from the lamps burning by their relics, or from soil from the ground where the saints are or were buried. Of course, most of the saints were also vehicles of miracles while they were yet in their bodies, and this miraculous grace continues to flow from them after their repose. ♦ (f) The physical world was created good and the process of the transfiguration of the world, which is the end purpose of the Orthodox Christian life and struggles, is part of the process of the transfiguration and salvation of each person. The incorruption of saints' bodies and the miracles performed through the relics of saints is a foretaste or firstfruits of the restoration of the world to the way in which God created it. HOW DO WE EXPERIENCE AND ENCOUNTER THE SAINTS THROUGH THEIR RELICS? Having briefly considered a few of the spiritual and theological principles that form the basis for the Orthodox veneration of relics, let us now briefly explore and describe the practical experience that Orthodox Christians have or may have with the saints by means of their relics. First, all Orthodox Christians have a very close experience with the relics of the saints, except that they usually are not aware of it. 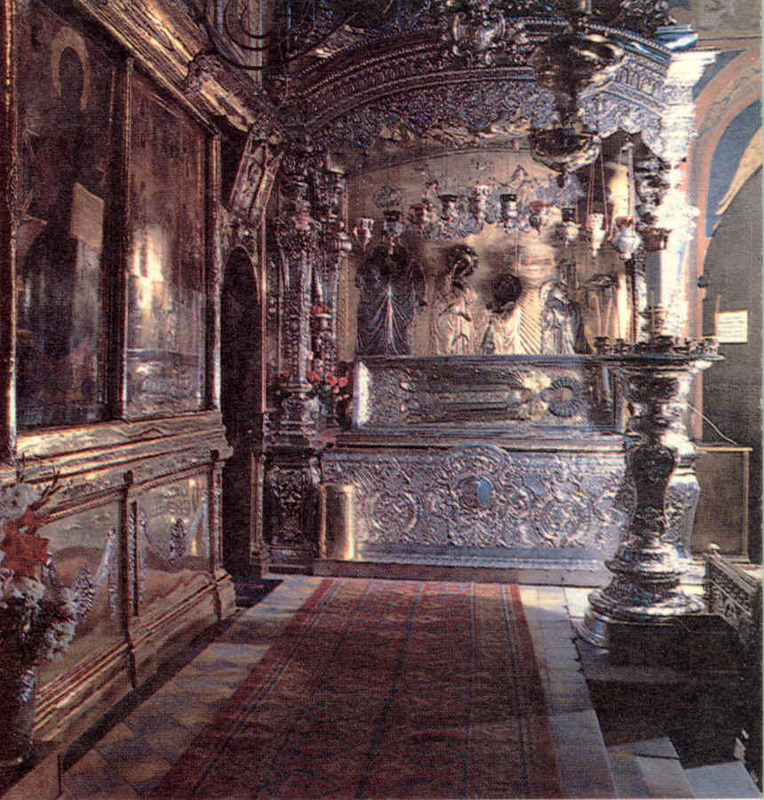 From the very earliest Christian times, the Divine Liturgy has been celebrated on the tombs of the martyred saints, (those who bore witness to the Faith), where, on the anniversary of the saint's martyrdom, the faithful would go to the catacombs (in Rome) or other place of burial, and celebrate the Divine Liturgy. This earliest Orthodox Christian tradition has been maintained by the Church — with a certain variation. Since we cannot usually go to the martyred saints' graves, one might say that the Church brings the martyrs' relics to us. How is this done? By means of an Antimension or Antimins. All Orthodox Divine Liturgies MUST be served on top of a special cloth, called an Antimins or Antimension, which is signed by the bishop and given by him to each church under his jursidiction (and occasionally to an individual priest). Upon each antimension is a representation of the Entombment / Lamentation of Christ, and into the antimension are sewn small particles of the relics (bones) of martyr-saints. Every church has at least one antimension, which permits the Liturgy to be served, under the authority of its bishop. (The photo, above left, shows a priest serving Divine Liturgy on the altar, with the chalice and diskos on top of the antimins.) Furthermore, when the full consecration of a temple and its altar is performed by the bishop, relics of martyr-saints are always placed into the altar (holy table) itself. Thus, every person present at each Divine Liturgy is actually participating in the veneration of relics, whether or not the person is aware of it. The lively and awesome, even mind-boggling experience of encountering the saints by means of their relics is actually the crux of the whole question of the practical experience of the veneration of saints' relics. When one journeys as a pilgrim to the places where the bodies of the saints are buried, and approaches with faith, one can truly encounter the saint, and feel the saint's holiness and close presence. Generally the saints' relics are miraculous, and very often they are incorrupt. (Incorrupt relics means that the skin has not decomposed, but is still present around the bones, and usually there is a sweet fragrance around the body, rather than the stench of putrefied flesh. In other words, the saint's body is not just a skeleton, but a whole body, with all the skin still there. However, these are not "mummies," for there has been no embalming whatsoever, which has never been an Orthodox practice. There are enumerable examples of incorrupt relics of the saints.) 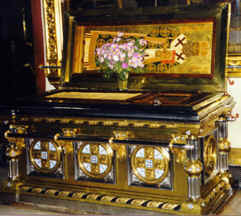 Customarily, after a holy person has been glorified as a saint, either locally or universally, the relics of the saint are placed in a large coffin or casket-like reliquary, which sometimes can be quite ornate, and carried in a grand procession to a new place of honor, often in the main cathedral, that is readily accessible to people so that they may venerate the saint's relics. (This "transferring of relics" is commonly translated in English as the "translation of the relics.") Frequently, it has been the many miracles that occur at the site of a holy person's relics, sometimes combined with their incorruption, that creates the impetus to initiate the recognition of the holy person as a saint and leads to their universal glorification, often following long-time local veneration. 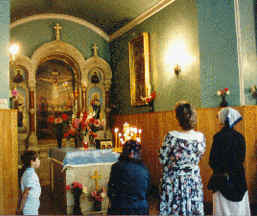 Pilgrimages to the relics of saints are not just something historical, belonging to the past, as it tends to be for Roman Catholics and to the West in general, but is extremely lively and active today in Orthodox countries and in Alaska (which is the closest thing to an Orthodox country in the Western Hemisphere). For example, countless thousands of people flock daily to the chapel over the relics/grave of Blessed St. Xenia of St. Petersburg (photo to the right), located in the Smolensk Cemetery in St. Petersburg, Russia. (See The Life of St. Xenia.) People pray inside the chapel during services that go on throughout the day, lighting candles and venerating her grave. And people pray outside also, walking around the chapel, praying on each side, and praying fervently while leaning their heads against the wall behind which is the grave of the Blessed One. This has been occurring without stop for the almost two centuries since her repose (around 1803). About 45 miles northeast of Moscow, in the city of Sergiev Posad, (previously known as Zagorsk in Communist times), similar thousands of pilgrims flock to the Holy Trinity-St. Sergius Lavra Monastery (see Beautiful Russia: Sergiev Posad) in order to venerate the relics of St. Sergius of Radonezh (photo to the left), which are located in the Holy Trinity Church (seeThe Life of St.Sergius). In Russia today many of the relics of saints that had been confiscated by the communists, have been recovered and returned to their traditional resting places, including such beloved saints as St. Seraphim of Sarov (see The Life of St.Seraphim), and St. Innocent of Irkutsk (see the photo at the top of this "Why Relics?" article, and see The Life of St. Innocent of Irkutsk). The relics of two of our own relatively recently-glorified American-Russian saints, St. Innocent of Alaska (see The Life of St. Innocent of Alaska) and Patriarch St. Tikhon (see The Life of Patriarch St. Tikhon), have been moved from their original burial sites to a prominent place in proper reliquaries so they can be venerated by the faithful: St. Innocent's relics (photo to the right) are located by the left front pillar of the Dormition Cathedral in the Trinity-Sergius Lavra Monastery (see Beautiful Russia: Sergiev Posad), and Patriarch St. Tikhon's relics are in a similar fine reliquary by the left front solea in the main cathedral of the Donskoi Men's Monastery in Moscow. In North America, numerous pilgrims journey to Kodiak Island, Alaska, each year for the annual feast day celebration and pilgrimage commemorating the glorification of St. Herman on August 8th-9th. Included in this pilgrimage, weather permitting, is the frequently difficult trip to Spruce Island where Father Herman lived for the latter part of his life. 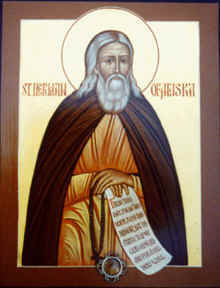 (See The Life of St.Herman). This has been, and always will be, the number one holy place in America, where we can really encounter the presence of a true saint who lived in our own land (and whose full relics are still here), encountering him by means of his holy relics (photo to the left), in addition to being present where he lived and walked and was buried. It has been a very strong and ancient Orthodox tradition for the faithful to go on a pilgrimage at least once a year to a holy place (holy, usually because a saint lived and was buried there, or where there is a miraculous icon). Frequently the pilgrimage is made for the saint's feast day, when many thousands may come for the celebration. Usually there is the Vigil for the saint the evening before the feast day, and then the Divine Liturgy is served on the feast day, followed by a Moleben or Akathist to the saint, frequently in conjunction with a procession with an icon of the saint. At the burial-site of specially beloved saints, it is common to sing an Akathist to the saint weekly, as is also done sometimes in parishes when they are blessed to have a small particle of a saint's relics, especially if it is the parish's patron saint, or a saint of the region. b) What does one do when one venerates a saint's relics? People venerate a saint's relics in much the same manner as on Holy and Great Friday/Saturday, when one venerates the Holy Shroud of Christ's Entombment (the plashchenitsa [Slavic] or Epitaphion (Greek)]: one makes three complete prostrations, and kisses the feet and the hands, and either the Gospels book (on the Holy Shroud), or the mitre or cloth over the head. Usually people venerate a saint's relics through a protective metal and/or glass cover of the reliquary; sometimes this interior cover is all glass, and at other times the interior cover over the lower part of the body is metal, with glass over the head. It is an extraordinary and rare blessing to have the interior cover opened up so that one is able to kiss a saint's holy body itself. There are numerous places throughout Orthodox lands where thousands of pilgrims journey to venerate their local saint or other specially beloved saint. By venerating the saint, not only does one convey one's love for the saint, but also, one may bring into oneself and one's life the holiness and the blessing of the saint, dependent on one's faith and receptivity; and at times various miracles may occur. To be able to venerate the full body relics of the saints where they are buried is an awesome, overwhelming and mind-boggling experience, and an incomparable blessing that words cannot begin to describe. Now, what about the veneration of saints through their relics for all those who cannot go to where the bodies of specially beloved saints are located? In a way similar to the Antimensia, when we cannot go to the saints relics, the Holy Church helps us by allowing the relics to be brought to us. This is usually done by the bishop in whose diocese a saint's relics are located, who takes a small particle of the saint's bones, and puts it into a specially prepared wax mixture which both protects and preserves the bone, and then places this relic-in-wax into a small round mini-reliquary, usually metal with glass. (A common type is like a silver star-burst, such as is attached to the icon of St. Innocent of Irkutsk, to the right.) This mini-reliquary can then be brought to a local church as a special blessing for that church and its people. (Relics are not to be kept in people's homes, but only at a church or a monastery.) It is very common that such small mini-reliquaries will be attached to an icon of the saint (as we see in the three icons shown here: St. Innocent of Irkutsk — to the right; St. Herman of Alaska — below, left; and St. innocent of Alaska — below right), although sometimes they are put into a glass-covered case. Certainly, it is true that it is more awesome, overwhelming and mind-boggling to be present by the saint's full-body burial casket-reliquary to most fully encounter the presence of the saint. We see a similar phenomenon in daily life, where people go the grave of a loved one to especially communicate with the person and feel the loved one's presence. But if we cannot go to the grave, we might gaze at a photograph of the loved one. Similarly, if we can't go to the beloved saint's burial casket-reliquary, we can gaze at an icon of the saint, through which we can encounter the saint, and we can venerate a little particle of the saint's relics, as though it were the entire body of the holy one, and encounter the entire presence of the saint. Yes, it takes a little more effort on our part to realize that the saint's entire presence is truly in the small particle of his body, but the reward is more than worth the effort. Perhaps we can understand this more vividly, if we reflect how there is a parallel to the experience of receiving Holy Communion: no matter how small a piece of the Body of Christ that we receive in Holy Communion, Christ's Presence exists fully and completely. And thus, in a similar way, if we are blessed to have available to us even the smallest particle of a beloved saint's relics, we can make the conscious choice to approach with faith and venerate that particle as though we were venerating the saint's full body in the saint's casket-reliquary. Furthermore, just as we must neither refuse to approach at all, nor to approach the chalice of Christ's Body and Blood and receive Holy Communion with indifference, so likewise, we must neither refuse to approach at all, nor to approach with indifference the precious relics (and icons) of Christ's Friends, His Holy Ones, His Servants — the Saints. Let us take full advantage of all the grace which Christ and His Saints offer to us by means of the relics of Christ's Holy Saints, by approaching with reverence, faith and love, and venerating the relics of Christ's Holy Saints, no matter how large or how small the relics may be.